Gantt charts illustrate project schedules according to the start and end dates of milestones and tasks. To access your project's Gantt chart, navigate to the Project Management > Gantt Chart. To view all milestones, tasks lists, and tasks in a Gantt chart navigate to Project Management > Gantt Chart. 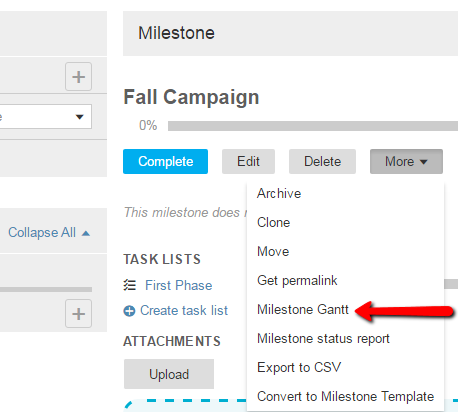 You can also drill down into a specific milestone or task lists and view a Gantt chart under the more menu. Select the printer icon to print your Gantt chart in either landscape or portrait mode. Select Collapse all or Expand all to consolidate or view all task lists and tasks at once. Select the zoom slider to zoom in and out of your Gantt and the Zoom to fit button to fit the graph to your browser's current resolution. View the scheduled timeline of a milestone, signified by the diamond within a circle icon. View the scheduled timeline of a task list, signified by the chart icon. Task lists are listed as subcategories of either milestones or the Task Lists w/o Milestones folder. View the scheduled timeline of a task, signified by a check mark. Overdue tasks are represented by a check mark and completed tasks are crossed out. Tasks are listed as subcategories of task lists. 7. Sort columns by ascending or descending order or uncheck a column to remove it altogether. *Note: You can also sort by the due date column as well. Track the progress of a scheduled milestone. Track the progress of a scheduled task list. Track the progress of a scheduled task. View task dependencies, represented by an arrow. You can also add a new task directly into a tasklist on the Gantt chart level by clicking to the right of any tasklist title (which will highlight the title line) on the list view, then select the "Add Task" button which will populate next to the fit to screen button. This will then allow to add a new task to the tasklist which is currently selected. 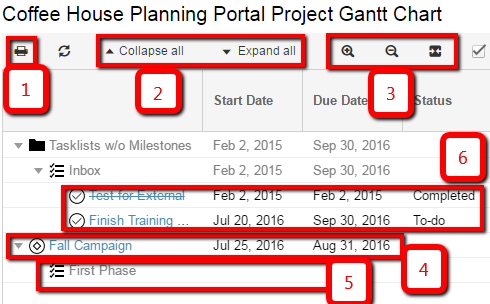 Change the start date and due date of a milestone, tasklist, or task by double clicking the date area in the gantt list view. Right-click on a task for the option to view the task, edit the task, add a new task to the task list, to change the status of the task, or to delete the task. You can now edit the schedule of your projects by interacting with Gantt charts. To interact with the Gantt chart, select Turn Edit Mode On, make the desired changes by dragging the milestone and task bars or new dependencies with your cursor, and click Save Changes. When editing Gantt charts, click and drag the entire bar to change the start and due date of a milestone, tasklist, or task but maintain the duration of these items. Or click and drag the edges of the bar to change the duration of the milestone, tasklist, or task and either the start or due date. To create new dependencies, hover your cursor over the edge of any task or milestone bar until a circle appears, click the circle and drag the dependency line to the circle associated with the dependent task or milestone bar. To shift dependent tasks and milestones, check the box to Cascade Changes before editing. Select Cancel Changes to undo any changes made to the Gantt chart. When Skip Non Working Days is selected while editing the Gantt chart, task durations will not include days that are designed non working days in Company Setup. In the example below, a task which spans across the non-working weekend will not include Saturday and Sunday in its total number of days. Also, tasks which are moved onto a non-working day will be automatically moved onto days when the company is considered open for business.